Stiffeners are secondary sections which are attached to beam webs or flanges. It's goal is to stiffen them from any deformations. A crank beam is an angled beam with two kinks, which makes a 90-degree angle. Main function of this beam is to support roof structures due to their shape. Added to this, full penetration welds are used for these connections to carry the load. In projects such as loft conversions or roofs it is preferable to replace a deep beam with two smaller beams. To ensure stability to buckling, these beams are bolted together and this is where spacer is used. Bottom plate is attached to a beam and its role is to support timber joists or brickwork. This connection is welded to one side of the beam in order to effectively support brickwork. This plate is designed at the bottom of the column and helps to overcome load which comes from steelwork to concrete. Top plate is commonly used to when beam is smaller than the wall and needs to be resized. The main principle principle of haunched beams is that framing into the columns reduces the design moment and deflection of the beams. Splices are used when a beam is too heavy or too long to install or transport safely. 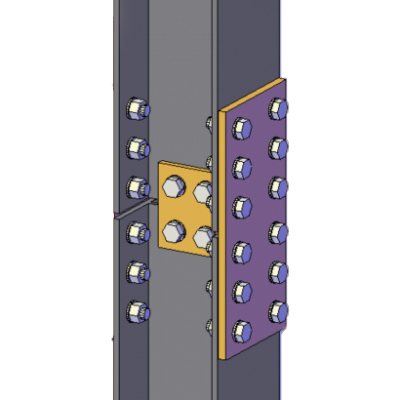 The flange plates need to be at least the same thickness as the beam's flange, and the same rule applies to the web plates. Plates welded on across column flanges in fabrication shop. Stiffener behind the plate forming 'T-sub'.